Escribe una carta dando las gracias por la entrevista. Escribe una respuesta a una pregunta de entrevista en nuestro blog. When most people interview for a job they get very nervous. Being nervous for an interview is natural but if you're prepared you'll feel more confident and you'll be more likely to get the job. Read the following tips on job interviewing and try them on your next job interview. Make a list of a few of your strong points that you want to emphasize in the interview. Think of things that make you good at that job. For example, “I am a patient person” or “I have experience in this kind of job.” These points are going to be things you need to remember to talk about in the interview. Get your clothes ready. Plan what you are going to wear. Make sure it is clean and ironed and the shoes look good. Call for directions to get to the place where the interview will be. Drive there a day or two before the interview to make sure that you know how to get there. Research the company. Look for information about the company on the Internet or talk to people you know who work there. The more you know about the company, the more informed you will be in the interview. Practice interviewing. Have a friend pretend that he is the person who will interview you. Have him ask you interview-type questions and practice answering them with confidence. Arrive to the interview a few minutes early. When you meet the interviewer (person who is interviewing you) make eye contact, smile, and give them a firm handshake. It's important to make a good first impression. Most interviewers make a judgment about you in the first five minutes. Make sure it's a good impression! During the interview speak with confidence and sit up straight. Make sure you talk about the strong points you put on the list you prepared before the interview. Work them into the conversation in a natural way or use them to answer one of the interview questions. Thank the interviewer for the interview. Go home and send them a thank you note and put it in the mail immediately. Contesta las siguientes preguntas de la lectura. 1. What does “research” mean in the following paragraph. Write an article about the company. Find out information about the company. Call the company. 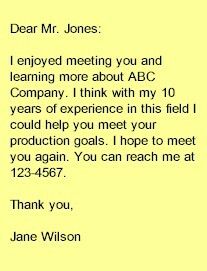 Write a letter to the administrator of the company. 2. Which of the following was NOT mentioned in the article? Arrive early to the interview. Brush your teeth before the interview. Smile when you meet the interviewer. Call for directions to get there. 3. Which is NOT an example of a strong point that you should mention in the interview? I have experience in this kind of job. I am a hard-working person. I was a supervisor at my last job. I was late for work once a week at my last job. 4. Which of the following is NOT a good way to make a positive first impression? Explain to the interviewer your salary requirements. Smile. Give a firm handshake. Make eye contact. 5. Click on the most appropriate thank you note. 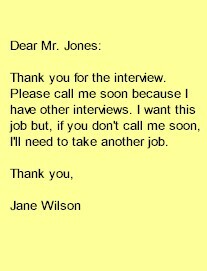 A post-interview thank you note should include the following information. Thank the person for the interview or make a comment like "It was nice to meet you." Mention again why you would be good at the job. Tell them how they can contact you (mention your phone number). Pretend that you just returned from an interview. Write a thank you note. Imagine que estás en una entrevista. El entrevistador acaba de preguntar por qué deben de contratar a ti. Describe tu experiencia de trabajo, tus habilidades, tu personalidad, etc. que hace que seas un buen empleado.